This meeting is a key milestone in the lead-up to COP21 in Paris at the end of the year. 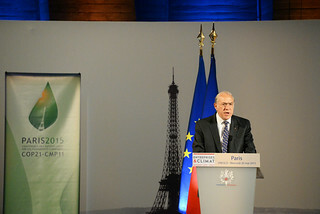 I would like to thank the French authorities and other partners for hosting such an important event. And that only credible, predictable and coherent policy signals and actions will allow business to make its full contribution. We are on a collision with nature. Unless we seize this opportunity, we face an increasing risk of severe, pervasive and irreversible climate impacts. We now know that to reach a 2⁰C target, emissions in 2050 need to be between 40-70 percent lower than in 2010 and near zero or below by 2100. Delay will make this transition harder and constrain our options. We have highlighted this indispensable, unavoidable and unassailable need since 2013. It proved controversial then. It is conventional wisdom now. Good! Clearly, the scale and pace of mitigation action will need to reflect different national circumstances, and will require significant financial and other support. But over time, each country needs to develop and articulate a pathway consistent with a future of net zero emissions globally. We welcome the commitments already made by several countries for their intended emissions reductions post-2020. These are not enough, however, to put us on a cost-effective trajectory to a 2⁰C world. We must do better. We can. This only increases the importance of what will happen in Paris in December. The new agreement needs to provide a flexible yet robust international architecture that allows us to increase our collective level of ambition over time in a credible, transparent and verifiable way. Business has a number of key roles to play in the transition to a low-carbon resilient future. Each business will need to consider its own strategic position and its new investments in the light of risks. Companies will also need to address emissions and resilience both within the firm and in their global value chains – the good news is many are already doing so. Business also has a major role to play in supporting governments to develop pathways towards low-carbon innovation ecosystems, where business works in close partnerships with research, regulatory authorities and sources of finance. Progress here will allow governments to go further, faster. However, many businesses and investors remain sceptical about the commitment of governments. This is not surprising! Only a tiny fraction of the close to 100 trillion USD in assets held by OECD institutional investors was invested in low-carbon infrastructure. We can do better! Progress on core climate policies, such as carbon pricing and phasing out fossil fuel subsidies, has been patchy at best. Government support for fossil-fuel production and consumption in OECD countries alone has been about USD 55-90 billion per annum in recent years. But lower oil prices present a unique opportunity to phase out fossil fuel subsidies and strengthen carbon pricing. The Indonesian government has shown what can be achieved in freeing up subsidy revenue to redirect it towards providing support for the poor while also reducing carbon emissions. Governments need to reassess the coherence and consistency of the much wider range of policy incentives they are providing to consumers, producers and investors. In a few days, at our Ministerial Council Meeting, the OECD, IEA, International Transport Forum and the Nuclear Energy Agency will deliver a major report called Aligning Policies for a Low Carbon Economy. This provides the first broad account of how the cost and effectiveness of climate policies depend on policy and regulatory frameworks in other areas such as investment, taxation and trade. Take the case of the electricity sector. You can have a carbon price to encourage low-carbon electricity, but if the regulatory framework for electricity markets sends short-term signals that discourage investment in capital intensive low-carbon technologies, then you’re attempting to fix things with one hand tied behind your back - or worse still, while the other hand works against the fix! Seeking to actively align policies is the only means by which we can take effective action. In the transport sector, tax codes give favourable treatment to company cars across our economies (19% of the total car fleet in OECD), resulting in more cars on the road and more carbon dioxide emissions, and at a cost to governments of between EUR 19 and 33 billion. In trade and investment, we have witnessed the increasing use of local content requirements in solar photovoltaic and wind energy, being implemented by at least 21 countries. But such requirements can severely hinder investment in clean energy! Business lies at the heart of what we need to achieve on climate action. If Governments produce clear, credible and coherent national policies and clear messages and signals, the full transformative power of business, markets and human ingenuity will be unleashed.